The mammals of the water are whippomorphs, represented by a blue whale, a dolphin, and a hippopotamus. The term “whippomorph” means “whale-hippo shape”, and it proves that scientists have a sense of humor. As with many sorts of modern mammal, the earliest whippomorphs appeared shortly after the non-bird dinosaurs were wiped out 66 million years ago. These ancestors were apparently large, semiaquatic mammals. 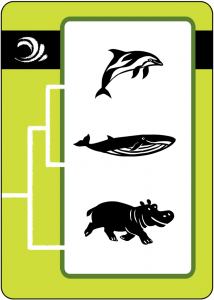 The clade soon split into two clades, one clade including today’s hippos, and the other including today’s whales and dolphins. The whale-dolphin clade is Cetacea, meaning “whales”. Blue whales and other baleen whales have no teeth, and instead they have baleen bristles that filter plankton as a food source. Dolphins are technically toothed whales, like sperm whales are. They prey on fish, like the earliest whales probably did. Air-breathing gives toothed whales an advantage over their water-breathing prey because air has much more oxygen in it than water does.